This is the list of Georgia Mapping Resources that are generally regarded as safe. Helpful for determining the "city' field when creating or editing road segments. GIS Locator (script) This script works with Georgia county GIS websites that are similar to 'https://qpublic.schneidercorp.com/' More than half of Georgia county websites are from this source. The script will capture latitude and longitude from WME, open the associated GIS map and with a couple of key strokes, take you to the same lat/lon on the GIS map. O.C.G.A. § 40-6-50. Driving on divided highway, controlled-access roadways, and emergency lanes. No vehicle shall be driven over, across, or within any dividing space, barrier, gore, paved shoulder, or section separating the roadways of a divided highway; except that a vehicle may be driven through an opening in such physical barrier or dividing space or at an established crossover or intersection unless specifically prohibited by an official sign, signal, or control device. 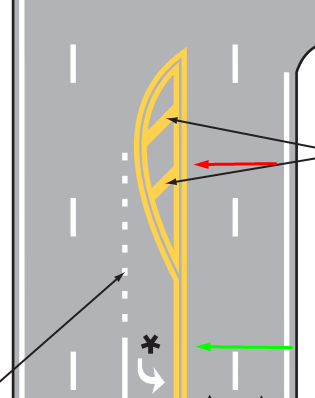 In simpler terms, in the state of Georgia it is illegal to cross a lined median (defined as a quad yellow lined median with or without diagonal lines or chevrons) unless it has an "opening," meaning it stops or is broken lined in a uniform manner. Green = left turn allowed across. Red = dividing space. Illegal to enter for any movements. O.C.G.A. § 40-6-121 : U-turns. 4. Where a prohibition is posted. Do not, under any circumstance, allow a U-Turn in Georgia in a situation that violates this law.